Second seasons are a lot like second dates…full of promise, potential, expectation…and pivotal challenge. We have seen, heard, felt, just enough to be intrigued, to want more, to come back and see where this can lead, what more there is to discover. We have offered just enough to hopefully capture the interest of the other person, but not shown our full hand….yet. At the same time there is a pressure that is very different from the nervous anticipation, the desire and need to make a good first impression, that we had pre-first date. There is now, in round two, the fine line balancing act of enough of what was great before and enough new so as not to be a ‘rerun’ of the first date. Second dates are fairly make or break in nature. I find it to be the same with the second season of TV shows. When the first season has captured our interest, engaged our heart, left us eagerly wanting more, the pressure is really on for the second season. Will there be enough of the same elements we enjoyed the first time around, yet also enough new aspects to not merely be a repeat performance? Will the audience still love the characters as they grow and evolve? Will there be just enough continuity blended in with exciting new elements? Add to that a timeslot change… different shows vying for viewership at the same time, even already loyal fans possibly being otherwise addicted at the new show time… Add to THAT a major calendaring shift (pun intended, thank you very much) from Summer to Mid-Winter lineup, and the challenge mounts even more. Viewers tune in with high expectations to a second season of their favorite shows. The Night Shift, which returned last week, certainly rose to the occasion, and our expectations and….surpassed them all! Last week’s Season 2 premiere was so well balanced, that it is hard to imagine Gabe Sachs and Jeff Judah even broke a sweat reuniting us with The Night Shift. Fact is, it takes immense talent, skill, patience, faith and perseverance to take potential, and maintain, let alone exceed already high standards of excellence. The writing was truly scintillatingly subtle. There were many storylines, relationships, and character experiences eloquently alluded to, or mentioned just enough in a passing moment or two of air time, yet powerfully present enough to be a marker of what is to come. The time lapse between the end of last season and the start of this season was covered in just enough detail and smoothly incorporated into current dialogues, that we were spared the stereotypical monologues usually required to fill in such gaps. 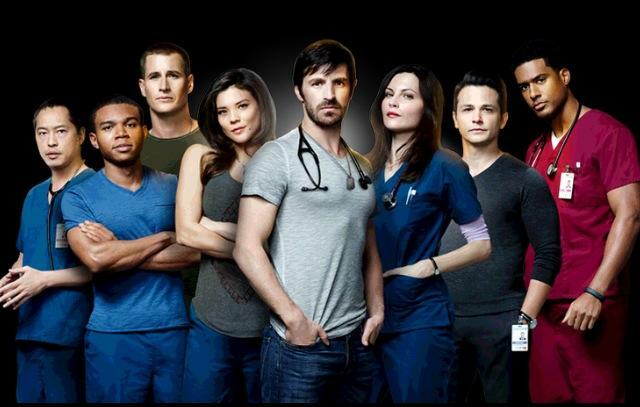 New characters were introduced and seamlessly woven right into the exquisite tapestry of The Night Shift cast. The characters we have been missing since the end of Season One, were back, true to themselves as we know and love them to be, even if greatly changed by life events. The premiere episode was a hit, scene after scene, from high adrenaline situations like TC saving a young boy mid-mountainside rappel, to the karmic rebound for Ragosa as he gets hassled for approving an expensive procedure (that season 1 baby’s dialysis doesn’t look so pricey now, does it Michael?? 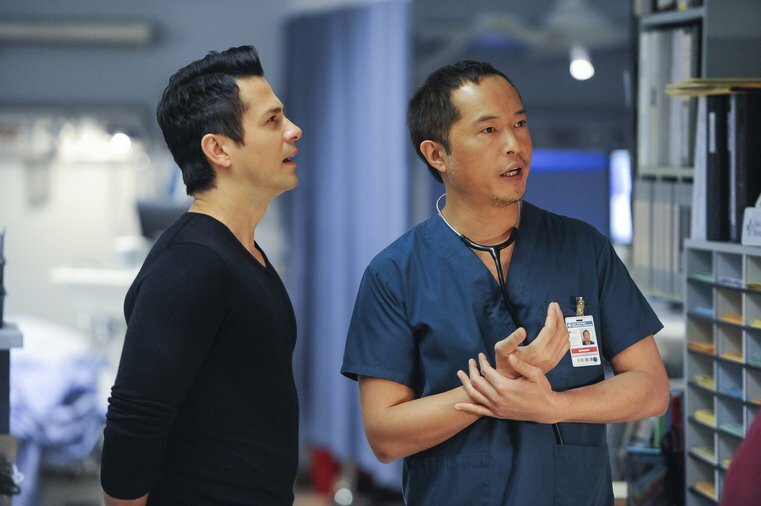 ), then his scenes freaking out over an impulsively executed decision, to the pranks between Paul, Kenny, Drew… and Molly….. to Jordan’s emotional scene’s with a patient’s daughter, to TC’s sacrifice for a friend, to yoga maneuvers by Dr Joey Chavez….to watching the elevator doors close on TC and Jordan.. EVERY scene was flawless. The guest stars were superb, each bringing so much depth to how their stories were portrayed. Now lest you think, the Night Shift team only amped up to hook and re-hook viewers with a stellar premiere, let me assure you that is not the case at all. Last night episode 2 aired. Almost like a double dose of the second date syndrome – second episode in second season. How did they fare? Personally, I was impressed – no easy feat as many of you know, ESPECIALLY when I have high expectations of people and their abilities, as I very much do in this case. When we watch a show or film, or read a book, we tend to go back for more, when they make us feel a certain way… not just entertained but actually feed an emotional need or space. For me – and clearly loads of others - there are two stand out aspects to The Night Shift that do my soul a world of good. 2) Loyalty. 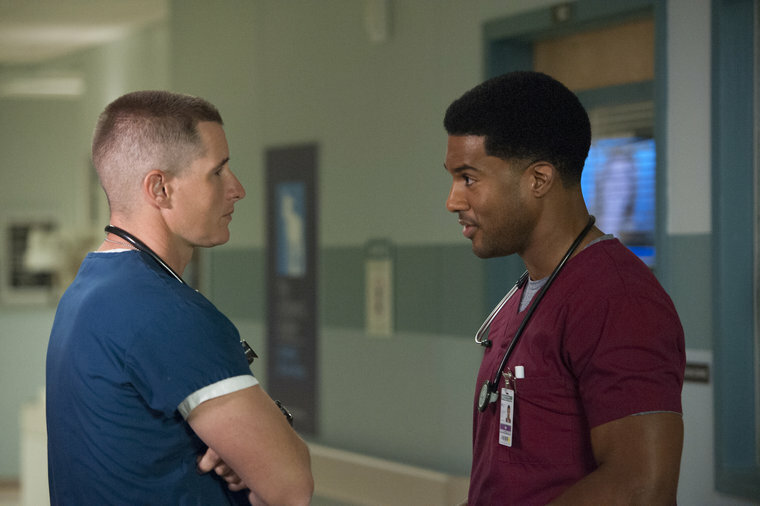 As touched as we all are by the medical cases that the Night Shift staff handles, what seems to reach out and grab viewers is the love, loyalty, and friendship that the characters share with one another . Even as romances fade and bloom, as professional positions realign, the bonds of love and loyalty… TRUE friendship and TRUE brotherhood/sisterhood is nearly tangible. For many in real life, those things are in short order. It is heartwarming, value and standard confirming to see that albeit in fiction, such values and bonds do exist. Of course enhancing that for viewers, is seeing that the cast themselves in real life seem to be the same with each other. When that spills onto screen and imbues the portrayal of all they are, all they stand for , and all they do...we are the lucky ones who in turn become loyal viewers. I guess there is that balance give-take thing again after all.